.Perienne lives and works in London and Suffolk in the UK. Her current work looks at connections between landscape -including everyday medicinal weeds and their folklore - and the role of the feminine. She makes drawings, etchings, artist books and installations. In 2006, she was awarded a scholarship to complete an MA diploma in drawing at the Royal Drawing School in London, where she was awarded the chairmans first prize for her end of year show. From 2008-9 she was and artist in residence at Kensington Palace and from 2009-10 was artist in residence at Chat's Palace arts centre. In 2014 she was artist in residence at Borgo Pignano, Italy on the Moritz-Heyman residency programme. She exhibits regularly nationally and internationally and has had solo shows at the Cueb and Laborimov Easton galleries in London and the Lookout in Aldeburgh. From 2009-2011 she sat for a painting for the artist Lucian Freud, the last he completed before he died, in 2011. ​She runs art workshops for the Royal Drawing School and other art institutions on a freelance basis and teaches art and creativity workshops to businesses and communities. Fermenting: Anything. She makes her own yoghurt, sourdough bread, sourkraut and sparkling beer. Walking: She loves nothing better than to walk along the wild and isolated Suffolk coastline, with her lurcher dog Stanley, dreaming and collecting interesting items to draw. Dreaming: She spends a good deal of her time day dreaming. It's how inspiration strikes, honest! ​You have to start somewhere and for Perienne Christian the start is part place part feeling. 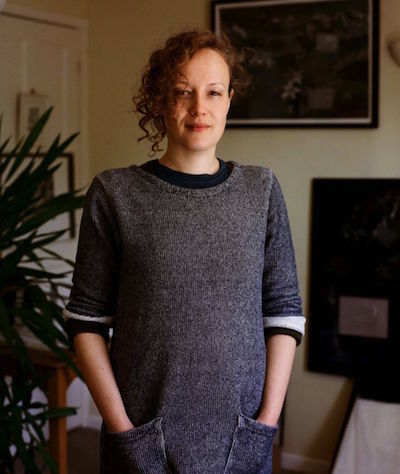 Her works may begin with a setting ‐Kensington Gardens or, nearer home, Horniman Gardens‐ but they sprout and ramify, seeding into imagined lands and situations. I could suggest that, as she happens to be living in Brockley, just a few streets away from Howson Road where he was reared in the 1900’s, Perienne has attuned herself somehow to the mystical HB pencilled vision of the poet‐painter David Jones. She hasn’t, because that’s not her style. She’s too observant, besides which she was barely aware of his work until well after she moved into the neighbourhood. There is however an affinity. Like Jones (and like the fairyland‐frieze‐painter Henry Darger who died in 1973 a year before Jones and in greater obscurity) she has a passion for the ins and outs of storytelling. Brought up with books and no TV and having therefore read her way through myth and fiction, now in her pieces, she concocts scenes, complete in themselves, that demand the attention, the perusal, that all good poetry requires. These drawings are not illustrative. They are ruminative. The eye lights on crow or traveller, a bend in the road leading to higher ground, here and there a stretch of colour or sudden dark patch. Some people are leading figures, others are incidental, yet they are all equally animate, vividly embedded where needs must in each providential scheme of things. There’s a lovely exploratory quality here, a sense of the fabric of life. William Feaver is a painter, writer and former art critic for the Observer. I investigate landscape and place through the lens of everyday weeds. Weeds are at best overlooked and at worst totally annihilated in our culture. But if we look to our not-too-distant past, many of these same weeds were prized for their food and medicinal properties. They hold our history and folklore in their very fabric. make medicines from, building an understanding of them that then goes into my artwork. I am intrigued by the 'old ways' of medicine women and midwives (women who were often obliterated during the witch hunts in the 1600's) and how the resurgence of these old ways can act as a reconnection to a more respectful relationship to the natural world. Scale and perspectives are not literal in my work. Sometimes supposedly animal species dwarf their human counterparts. The space I am creating reflects that described by Blaise Pascal; ‘an infinite space whose centre is everywhere, whose circumference is nowhere.’ There are no obvious narratives here; rather something circular that has no beginning and no ending. Despite multiple viewpoints, the works carry stories, which the viewer can interpret for themselves. As in 15th century Chinese Shan Shui painting, the image is not an open window for the viewer’s eyes, but an object for the viewer’s mind, a vehicle for philosophy. 2003‐2006 Bath Spa Universty. Fine Art and Creative writing, 1st class hons. 2014 Artist in residence, Pignano Italy on the Moritz- Heyman residency programme. 2006 Scholarship for year of study, The Royal Drawing School. 2017 Everyday Weeds - The Lookout - Caroline Wiseman, Aldeburgh. 2012 Running With Wolves, Labomirov‐Easton Gallery, London. 2010 Scene/Heard Journey to the back of the Yard, cueB Gallery, London. 2016 Exhibition of drawings, Christie's New York. 2010 Jerwood Drawing Prize, Jerwood space, London and various other venues across the country. 2010 Permanent Group Show, Dean St Townhouse, Soho House. 2009 V,Thomas Williams fine art, London, Bond St.
2009 Kunskog, 5 Hundred Dollars Gallery. London, Vyner St.
2009 We are such things as dreams are made on, Mission Space, London, Hackney Wick. 2009 April is the Cruellest Month, RK Burt Gallery, London, Southwark. 2008 Loop 08, The Menier Gallery, London, Southwark. 2008 Paper Scissors Stone, The London Print Studio, Harrow Road. 2007 High Tea, T‐Building, London Shoreditch. 2007 The Drawing Year, The Prince’s Drawing School. 2006 New Friends, John Betjeman Centenary Celebration, Bristol.